William Sylvester Taylor was born in Butler County, Kentucky, on 10th October, 1853. Although he had no formal education after fifteen, Taylor became a successful lawyer and served two terms as county judge. 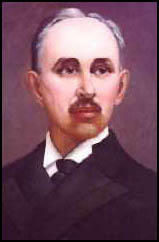 In 1884 Taylor joined the Republican Party and regularly attended national conventions and served on state committees. In 1895, William Bradley, governor of Kentucky, appointed Taylor as his attorney general. In 1899 Taylor was selected as the Republican Party candidate for governor. His main opponent was William Goebel of the Democratic Party. The election was controversial and there were claims of ballot rigging. When the vote was announced, Taylor won by 193,714 to 191,331. Taylor took office on 12th December, 1899. However, the Democratic Party challenged the result of the election, threats were made that if William Goebel won on appeal, he would be assassinated. Goebel was given bodyguards but on 30th January, 1900, while Goebel was entering the State House, a gun was fired from the window of the Secretary of State's office. The bullet hit William Goebel and he was taken to hospital and while receiving treatment it was announced that as a result of the investigation he was now the governor of Kentucky. However Goebel died of his wounds on 3rd February, 1900. Taylor fled to Indiana and refused to return to face charges of conspiring to murder Goebel. Several men were arrested including Caleb Powers, Kentucky's Secretary of State. Eventually Henry Youtsey and Jim Howard were convicted of murder while five others, including Powers, were found guilty of conspiracy. Taylor refused to return to Kentucky to face trial and stayed in Indiana where he became a successful insurance executive. This upset those on the left when in 1905 William Hayward (general secretary of WFM) and Charles Moyer (president of WFM), were both been kidnapped in Colorado and taken to Idaho to stand trial for the murder of Frank R. Steunenberg, the former governor of Idaho. In 1907 an article by Fred Warren, in the radical journal, Appeal to Reason, complained about the failure of the authorities to arrest and charge Taylor with murder. When Warren advertised a reward of $1,000 for the arrest of Taylor, Warren was himself arrested and charged with encouraging others to commit the crime of kidnap. After a two year delay, Warren was found guilty and sentenced to six months hard labour and a $1,500 fine. On 23rd April, 1909, the Governor of Kentucky, Augustus Everett Willson, pardoned Taylor, Caleb Powers, and four other people who had been found guilty of conspiracy. William Sylvester Taylor died in Indiana on 2nd August, 1928.